Ken Follett's Fall of Giants, the first novel in his extraordinary historical epic The Century Trilogy, was an international sensation. 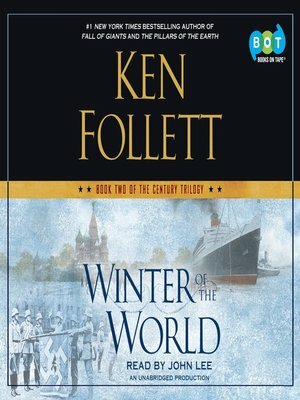 Winter of the World picks up right where the first book left off, as its five interrelated families enter a time of turmoil, beginning with the rise of the Third Reich, through the Spanish Civil War and the great dramas of World War II, to the explosions of the American and Soviet atomic bombs and the beginning of the long Cold War. Carla von Ulrich, born of German and English parents, finds her life engulfed by the Nazi tide, until she commits a deed of great courage and heartbreak. . . . American brothers Woody and Chuck Dewar, each with a secret, take separate paths to momentous events. . . . English student Lloyd Williams discovers in the crucible of the Spanish Civil War that he must fight Communism just as hard as Fascism.... Daisy Peshkov, a driven social climber, cares only for popularity and the fast set, until the war transforms her life, while her cousin Volodya carves out a position in Soviet intelligence that will affect not only this war but also the war to come. These characters and many others find their lives inextricably entangled as their experiences illuminate the cataclysms that marked the century.